Today, Friday, July 19, between 2127 and 2142 UTC (5:27-5:42 EDT), the Cassini spacecraft will be taking pictures of Saturn. It has been doing that for almost a decade now (since it arrived in 2004) but what makes these pictures special, however, is that the pale blue dot of Earth - our home - will be visible as well. It's been done before. I've used the image below, taken by Cassini in 2006, when I teach Solar System Astronomy showing Earth just above the rings of Saturn (but almost a billion miles away). It's the pale blue dot first made famous by the late astronomer Carl Sagan back in 1994 from Voyager spacecraft images. All humans who've ever existed were born and died on that little blue dot. The Cassini Imaging Team Leader Carolyn Porco has organized an event called The Day the Earth Smiled and is urging everyone to go outside when Cassini is imaging Earth and smile, wave, raise a glass, whatever to Saturn. Really, to ourselves, as humans, for having the ability to take a group picture from a billion miles away. At 5:30 pm, here in the Hudson Valley, Saturn will be out (but not visible since it's daylight). 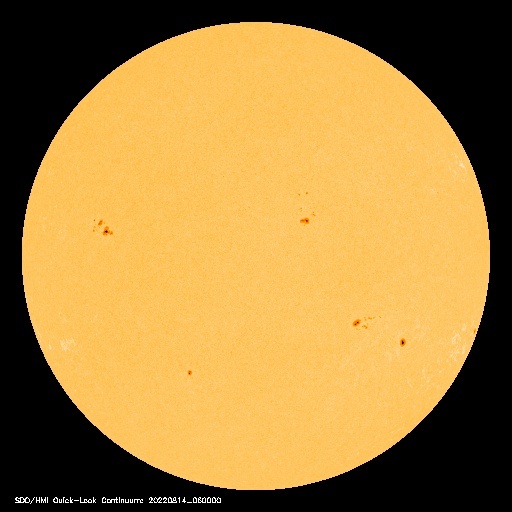 It will be about 30 degrees above the horizon in the southeastern sky (148° azimuth). It will also be some 900 million miles away from us. The image below shows the positions of Earth and Saturn in the solar system today. Can you see why Saturn is in the southeastern sky in the evening? 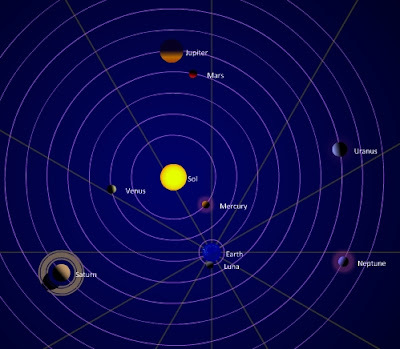 Below is a simplified view of the orientation of the Sun, Earth, and Saturn (not to size or distance scale). 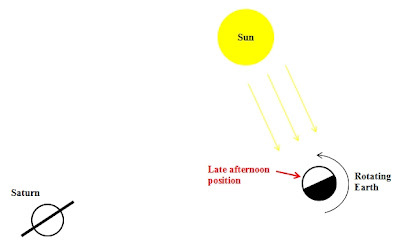 The half of the Earth facing the Sun is illuminated in daylight and the half facing away is dark nighttime. From above the North Pole, the Earth is rotating counter-clockwise. 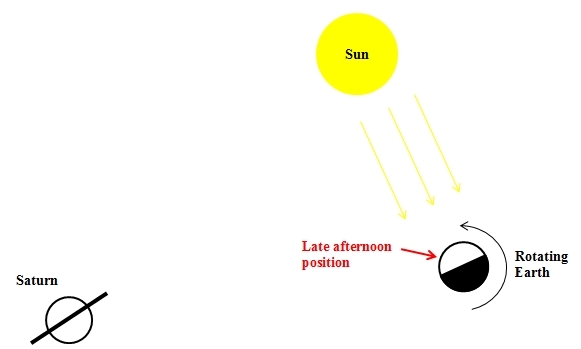 Our position on Earth in late afternoon (5:30 pm) is shown with the red arrow. It's still daylight (we can see the Sun) but we can also see Saturn rising in the east (theoretically, can't really see it because the sunlight washes out the dimmer light of the stars and planets). So today at 5:30 this evening, here in the Hudson Valley, go outside, face the southeast, and smile at Saturn. I'll post the picture from NASA as soon as it's released (and take a picture of myself waving to Saturn from Earth).